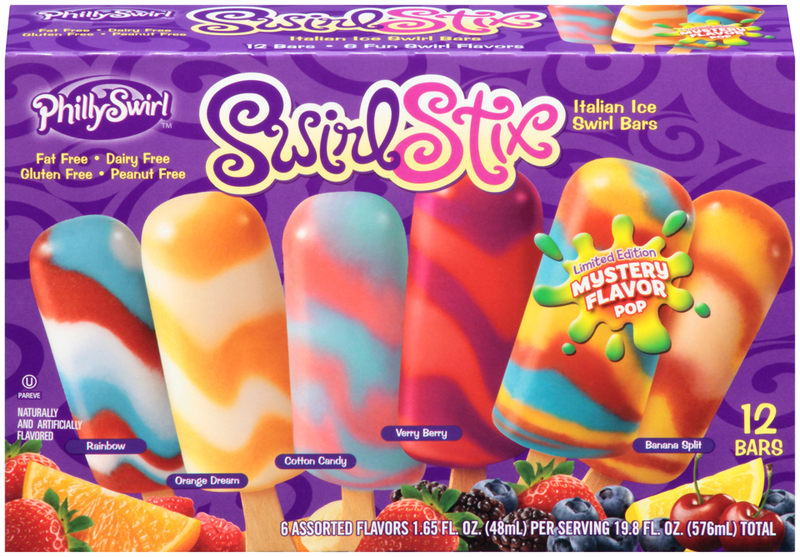 I had the luxury of being sent PhillySwirl Swirl Stix, Swirl Cups with Candy Spoonz, and Swirl Popperz for free (my boys were delighted) in exchange for an honest review. We are not strangers to PhillySwirl products as we found the allergy-friendly Italian ice at our local grocery store some time ago. My boys and I were able to eat all three boxes over the last couple of weeks so that we could share with you how we honestly think about these allergy-friendly products. All three PhillySwirl products that we reviewed are free of the top 8 allergens (dairy, soy, egg, peanut, tree nut (with the exception of coconut), fish, shell fish, and wheat), fat free, gluten free, and contain no high fructose corn syrup. They are also made in a peanut/tree nut free facility. They taste GREAT!!! My boys and I ate these treats daily, never getting sick of them, while enjoying the summer sun. We ALL enjoyed them and requested them until the boxes were empty. For an allergy-friendly product this is RARE! The Swirl Cups with Candy Spoonz were frozen enough for travel. We were able to pack the Swirl Cup into a lunch box with a small ice pack and bring it to our local ice cream stand where we met up with friends. My son was thrilled to pick out an Italian ice Swirl Cup flavor and a Candy Spoonz flavor before leaving and ever more excited about his tongue changing color with the flavors. I’m not thrilled with the artificial food coloring, but I wouldn’t let that stop me from purchasing any of the products. I would be willing to pay more money if they offered the same items with no artificial food coloring, even if it meant that my son wouldn’t have the ability to show me what color his tongue is. Do not, I repeat, DO NOT eat a PhillySwirl Italian Ice immediately before a job interview, a photo shoot, a public appearance, or your wedding unless you don’t mind a very colorful tongue! Al in all, my entire family loves the allergy-friendly PhillySwirl products. I favored the Swirl Popperz Orange Dream Flavor because you could eat them with one hand while reading a book and they’re soft and delicious. My oldest son favors the Cotton Candy Swirl Stix because he’s a popsicle kind of guy. 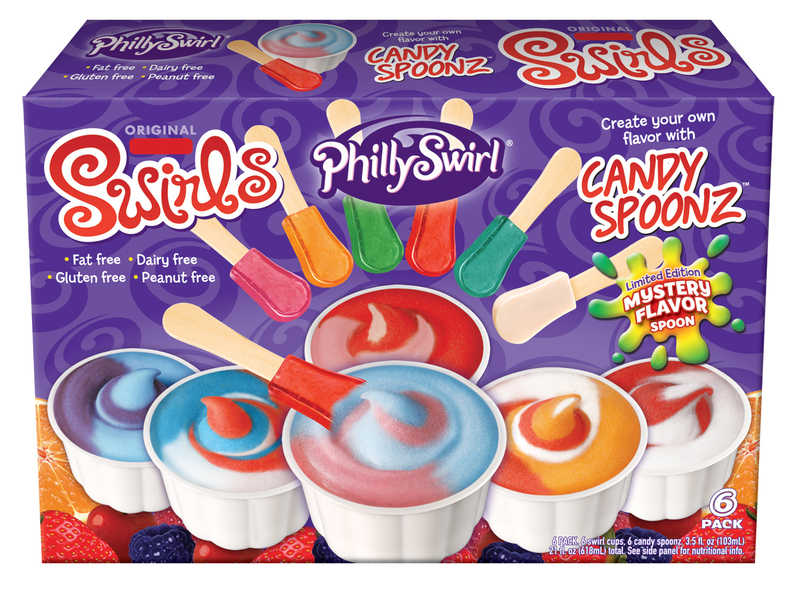 My youngest LOVES the Swirl Cups with Candy Spoonz (best when microwaved for 15 seconds and stirred) probably because he gets to choose two different flavors and make his tongue all sorts of fancy colors! 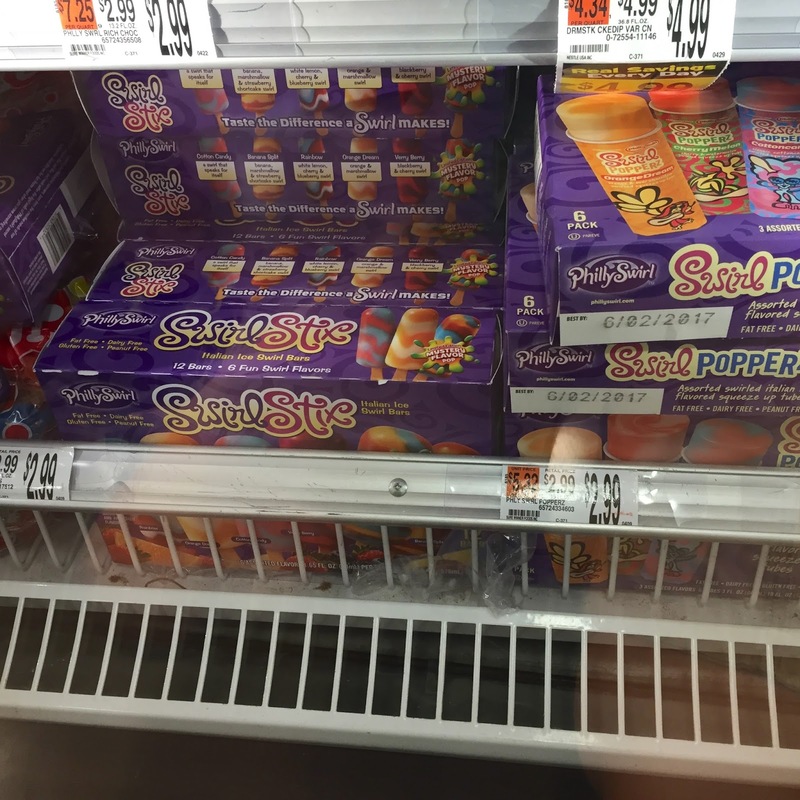 I love that my local grocery store carries the products (look for the bright purple box) at a very reasonable price, which isn’t always the case with allergy-friendly items! Find them at your local grocery store! $2.99 for a box of allergy-friendly treats? one treat from the ice-cream truck! Thank you, PhillySwirl, for allowing me to review your product!